On 25 November last year, whilst admitting our general ignorance and total absence of predictive success so far, we wrote: 'Parliament will accept the Withdrawal Agreement comfortably.' Well, that's one more prediction gone wrong. Our heads do not hang in shame, though: every other media commentator has racked up a list of predictive failures on the subject of Brexit much longer than ours. However, in its general thrust our piece has proven to be pretty perceptive. The foolishness of holding referenda in the British system has been revealed – no one will ever want to do that again, despite the idiots currently calling for a second referendum on some yet to be defined Brexit question. The few referenda there have been in the British system have been held in the furtherance of some political trickery or other – following or implementing the 'will of the people' has never been a factor. The Brexit referendum was no different: it was Tory trickery attempting to see off the emerging UKIP. The proposed second Brexit referendum would be, once again, merely political slight of hand. A large majority of MPs are Remainers. Did anyone ever think that Parliament would implement something to which it was so fundamentally averse? The dim but authoritarian personality of Theresa May managed to come up with a departure plan with which hardly any MPs could agree. The only thing the plan has done is to show that Parliament is hopelessly divided and has no collective idea of what it wants. It was divided three years ago – and it is just as divided now. In its tortuous gestation, May's plan has also very efficiently wasted those years – years that Parliament, properly led, might have used to come up with a collective idea. It is difficult to see what can possibly heal those divisions. Were there to be a six month delay to negotiate an agreement with the EU, at its conclusion the situation would be no different than it is now. 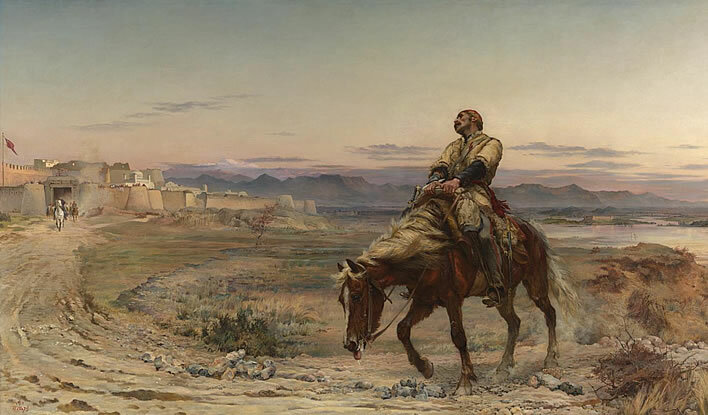 Elizabeth Butler, The Remnants of an Army, 1879. Image: Tate London. Cancelling Brexit by withdrawing Article 50 would bring about one of the greatest upsets in British political history and be a fine test of the usually politically phlegmatic British. UKIP has been in increasing disarray since the last referendum. If a general election were called now there is next to no chance that the party will have any effect on the outcome. Our preference would be for Britain to leave the EU in March without an agreement. Let's place our faith in capitalist, free-market economics. Let's reject customs unions and single markets: not everything has to be ordained and micromanaged by the state. There are a number of indicators that suggest that the companies most directly affected by such a Brexit already have plans in place to mitigate any problems and minimise any financial losses. Let's leave it to them and the good, old-fashioned, profit-driven homo economicus– sooner or later (probably later) the politicians will catch up.